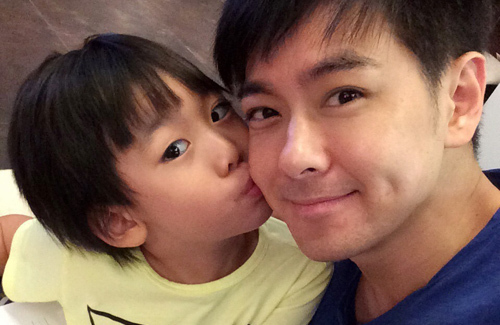 Jimmy Lin (林志穎) found his image to be at stake when he was faced with the pressure to either announce the birth of his son or keep it a secret. “My [career] situation then was not as bright as it is now. I thought about how news of my engagement and the birth of my son could anger and upset many of my fans,” said Jimmy in an interview. Taking fans by storm when he burst upon the Taiwanese music scene when he was only 17 years old, Jimmy saw his career peak, then dive after his mandatory military service was completed. He has always been careful in handling his personal love life, even denying that he was dating former model Kelly Chen (陳若儀) for fear of fan backlash and disapproval. He only admitted that he was involved with Kelly for five years after their son, Kimi, was born in 2009. Jimmy is currently promoting the release of his new book, My Patience with Time <我對時間有耐心>. Who cares what’s he is doing right now? It’s been such a long long time when he was popular. Besides, fans nowadays aren’t so fanatic like it used to. Many famous celebrities are openly sharing their married licks with the world. Fans are very supportive of them. The entertainment industry has changed. Celebrities are humans too. That and because all his fans grew up, too. It’s almost 20 years and I’m sure his fans are married now. Jimmy’s still very popular in mainland China. In fact, all the former members of Taiwan’s ‘4 Heavenly Kings’ are still very popular in China 20 years later. i was super in love with him back then lol and i’m married now but I still think he’s hot. Regardless whether he’s married or not, i never had a thought to be married to an actor. That’s too crazy, i would be happy for the stars when they announced their marriage/have kids. too many crazy fans create idols as the center of their empty lives. Years ago, a Japanese fan of Jackie Chan committed suicide when she learned he was married. What you said is true Maria and thankfully many fans these days are better and more real. However,there are still some crazy ones that prevent their idols from sharing their joy like that severe case with Jackie’s fan. Recently,there was this other crazy Japanese fan that literally stalks Taiwanese singer Jam Hsiao. He was even attacked a few times and many wondered if those attacks were related to her. But Jam is still a new star while Jimmy is no longer a hot shiny star so he honestly has nothing more to hide. Does anyone find his son’s name a bit weird? Kimi sounds like a girl name, not a boy name, unless there is a hidden meaning in it? Kimi sounds like japanese name to me. I think he got it from a combo of his name and his wife’s name. I also thought it sounded girly. Sigh. I feel sad to hear that stars are purtting their lives on hold due to some unreasonable fans. If a fan really loved and cared for their idol, then they should rejoice at him finding someone he loves and starting a family. I have no problems with jimmy not admiitimg his love life. But i am glad he has come out to the public with his son. Hope that makes Jimmy’s family less burdened.